The other day I accompanied my husband on a trip to the local garden center to buy bird seed and dog food, and upon his urging, picked up a six pack of annuals to go. He handed me the receipt on the way out and asked me to look it over because, "I think they may have overcharged us." After giving the bill the once over and telling him it all looked kosher, he still wore that "I've been fleeced" look. "How much did you think the plants cost," I asked. I had to laugh. It had been awhile since he'd gone plant shopping with me. (Actually, it was just last year on our Ohio Plant Odyssey, but I'd managed to lull him into vacation mode so he didn't notice.) 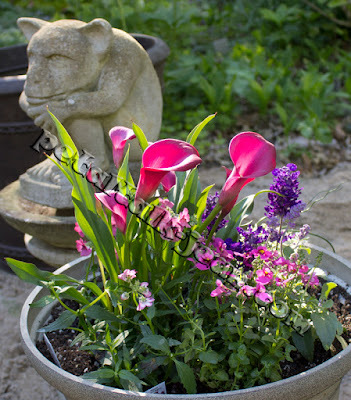 Some garden centers are pricier than others, and this one was on par with low to mid-range, charging $5.99 apiece for 4-inch pots that are actually about 4.25 - 4.33 inches in diameter. It's so tempting to put together a little "outfit" that goes so well together, which I did with my feed store/garden center purchase. But it's certainly not complete. The creation cries out for some spillers and even another thriller. The Calla will mostly likely finish up its bloom, as will the other flowering plants, so I'll be left with the Salvia 'Cathedral Purple' for color, and a bunch of leaves from the other plants. With the weather somewhat unsettled over the past week or so, I've been planting those plants that have been hardened off, or acclimated to the outdoors. I leave room for additions as they come in. It's not a bad idea to go on at least two shopping expeditions for the best combinations. At Thursday's plant shopping extravaganza I'll be looking for tall plants with a narrow shape, perhaps some grass-like tropicals. I'll also search for some spillers, as they're so versatile for softening the edges of the pot. 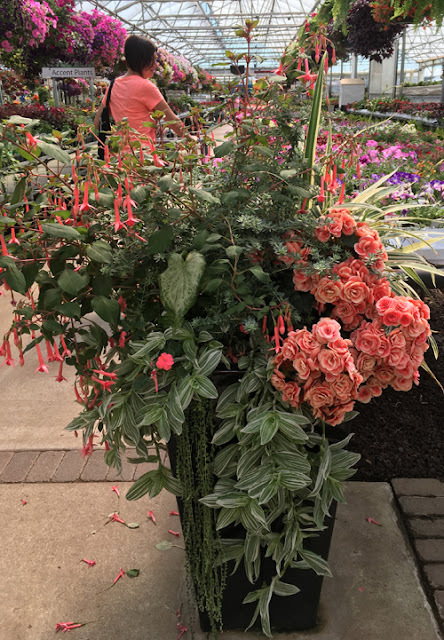 I will strive to capture the exuberance of this container combination on display last year at River Street Flowerland in Kalamazoo, MI. I'd purchased several blooming Begonias on our first plant shopping trip, along with several other flowering annuals, but once again, I'd ignored the importance of foliage for a cohesive and exciting combination. So today, I'll be taking stock of what I've bought so far and perhaps even snapping a photo or two so that I can create some combinations that might have the impact of the one I'd seen at the garden center I'll be visiting tomorrow.